The annual Charity Bazaar sponsored by the Bangkok Hospital Pattaya (BPH) was an even bigger event than the previous bazaars. With 24 charity groups represented at the booths, there were plenty of shopping opportunities, and with a full program of entertainment it was certainly an “event”! 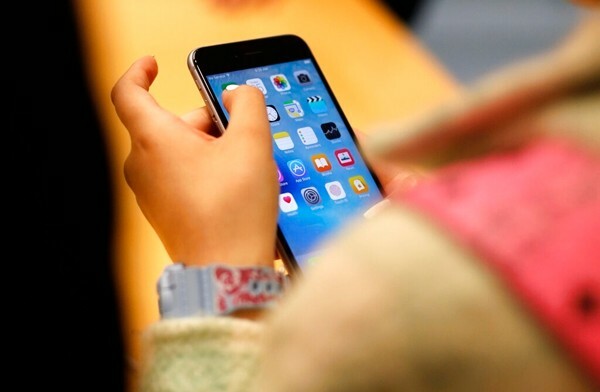 The bazaar was advertised as commencing at 9 a.m., but the Jomtien Lions Club stall found itself deluged by bargain hunters at 8.30 a.m. and by 9 a.m. was almost sold out. Some lucky people certainly knew where to shop for bargains. 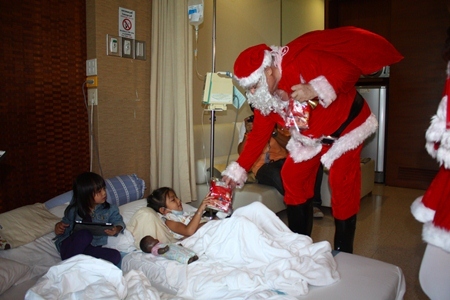 Children from Redemptorist School for the Blind receive sweets from Santa and his helpers. A very welcome addition this year was the stall from the Banglamung Home for the Aged, with one of the ‘senior’ people selling hand-crocheted scarves. Star of the show was of course Santa Claus, who parked the reindeer on the helipad and came down with his two beautiful helpers and distributed Xmas gifts to all the children who were waiting – all 280 of them! 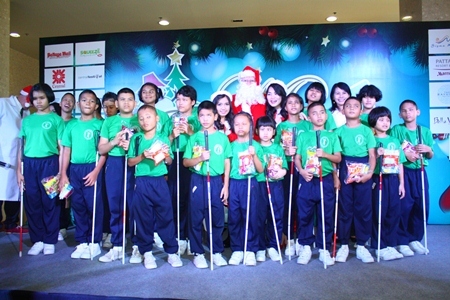 These included the children from the Maha Thai Blind School who would never “see” Santa, but could experience the spirit of Xmas through the event. Lewis “Woody” Underwood (center), along with Bernie Tuppin (right) and the Jesters Care For Kids committee open a booth at the Charity Bazaar. Amongst the entertainment acts (which were non-stop) were dancers from the Children with Special Needs group, which prompted the MC to say that they were really “special” children, rather than “special needs” children! 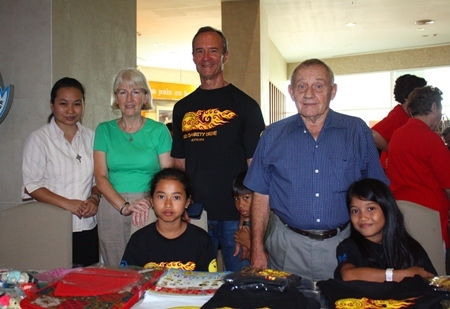 The BPH Charity Bazaar has now become one of the major fund-raising events in Pattaya, and the hospital is delighted with the response, and congratulates all the charities on their good work with the needy children in the area. 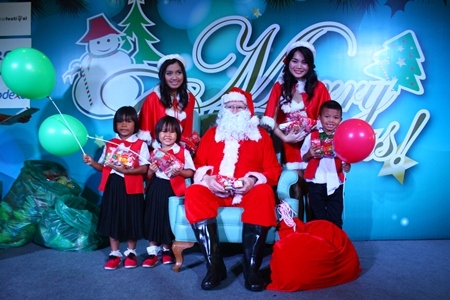 Children from Mercy Center Pattaya pose with Santa and his helpers. 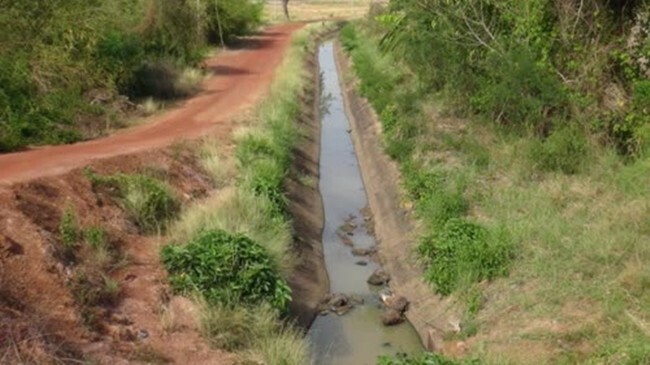 Previous articleSugar Hut – the icing on the Thappraya cake?